We are due to start work on drainage improvements on the B4058 through Bagstone, near Rangeworthy, on Monday 4 March 2019. This work will take up to 10 months to complete. We will be undertaking the majority of the work using temporary traffic signals, however, we may need to close the road for limited periods. Access for residents and businesses will be maintained during any closure period and a signed diversion route will be in place. 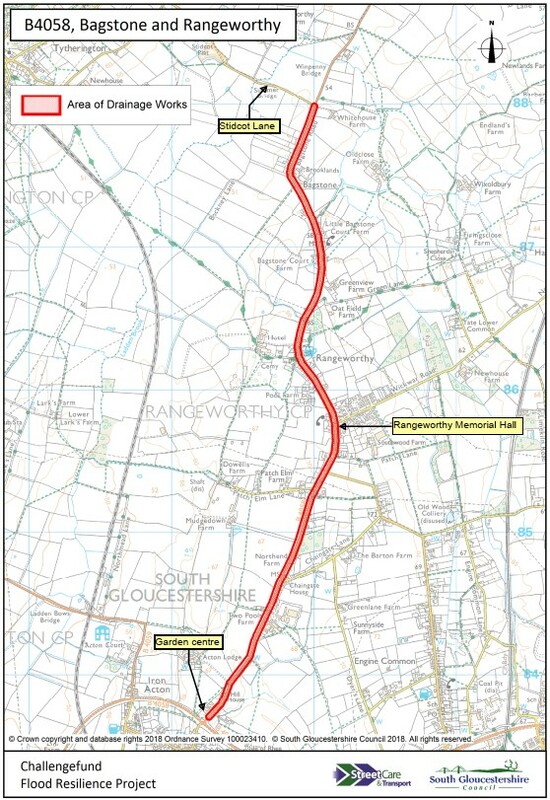 The B4058, Bagstone was selected as one of nine sites across South Gloucestershire as part of a wider £3.35million Government funded scheme to improve drainage and flood protection systems. The road floods on a regular basis causing traffic disruption, damage to properties and to the highway. We have carried out comprehensive survey work which shows there are numerous defects with the drainage system. Repairs will include replacing and/or upgrading defective pipes, removing root ingress from trees and replacing defective manholes and gully covers. Whilst our CCTV surveys revealed significant damage, we may find further defects as we begin work on site. It is therefore difficult to provide an accurate timescale of the works but we anticipate it will take a minimum of 10 months. We will provide updates for residents as we begin work on site. We realise these works will have a significant impact on the local community and road users. In order to discuss the scheme with you in more detail and provide you with the opportunity to ask the team any questions, we are holding a drop-in event in the community. Members of the project team will be on hand to answer any questions about the work we are carrying out, the benefits it will bring and the traffic management required. To stay up to date with the project, you can subscribe to our regular newsletter. We will update you on the progress of the works but if you have any queries regarding this letter please email the project team FloodResilienceProject@southglos.gov.uk or call us on 01454 868000.